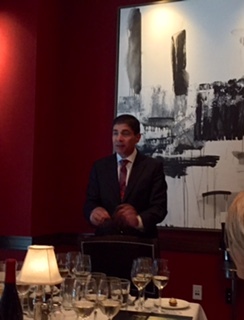 Master Sommelier George Miliotes was in Houston last night presenting his wine selections for this summer's "Generous Pour" event at The Capital Grille in City Center for local wine and food writers. From now until August 30, guests can opt to indulge in eight wines that are new to the menu for $28 per person. 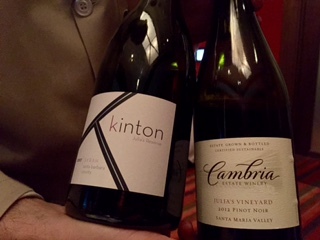 This year's fun twist is that all of the selected wines were produced by women in California. The list features three whites and five reds in a range of varieties and styles. We started with the 2013 Barrymore Pinot Grigio from Monterey. This fresh and fruity easy-drinking white paired perfectly with the pan fried calamari with hot cherry peppers. This was followed by the Galerie "Naissance" Napa Valley Sauvignon Blanc which was aged on its lees in neutral oak barrels giving an added richness to the wine and it was served with prosciutto wrapped mozzarella and vine ripened tomatoes. 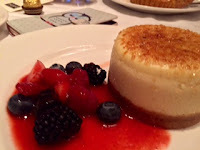 The final white wine was the very limited production Stonestreet "Bear Point" Alexander Valley Chardonnay made in California's classic style- oaky and creamy, perfect with the lobster and crab cake appetizer. I next enjoyed tasting the red wines with my dinner entree of porcini rubbed bone-in ribeye with 15 year aged balsamic accompanied by lobster mac 'n' cheese, roasted brussels sprouts with smoked bacon, grilled asparagus and roasted fingerling potatoes. The red wines include the single estate Cambria "Julia's Vineyard" Pinot Noir from the Santa Maria Valley, the Matanzas Creek Sonoma Merlot from cooler climate Bennett Valley, the limited production Arrowood Reserve Speciale Sonoma Cabernet Sauvignon, the Mt Brave Napa Valley Cabernet Sauvignon from Mt Veeder and the 2007 Kinton Syrah from Santa Barbara which George Miliotes called California' greatest vintage. All five were excellent wines but the Syrah was the best pairing with my steak; it was very smooth with spicy berry flavors and a slight savoriness in the long finish. The evening ended with coffee and an array of desserts including flourless chocolate espresso cake, coconut cream pie and cheesecake with seasonal berries. The food was all delicious and the new "Generous Pour" wine list offers something for everyone, it would make a great date night or a fun evening out with friends. It is something to check out before the month ends, don't miss out! Learn more about the women behind the wine- here.